Visual presentation becomes a decisive factor when it comes to electronic products and hence display racks and shelves are very important to capture the attention and fancy of the customers. Adequate Steel is one of India’s leading manufacturers of electronic racks as it offers all that is essential to make a complete presentation to impress the walk-in customer. One of the most popular products today is the laptops and these have become an integral part of any electronic store sales in the present day. Therefore it becomes essential to display these electronic products in the right manner to be able to lure in market potential. More often than not the customers who walk into an electronic store come with the intention of buying products and with laptops becoming a necessity for individuals these days, it becomes all the more important to display and present them in the right manner. Visual marketing is the order of the day and this is exactly what Adequate Steel presents to its retail clients – a complete visual presentation that will lure in buyers to make the purchasing decision. Electronic laptop display racks have become the order of the day to highlight the brand, model and specific features of the model on display. 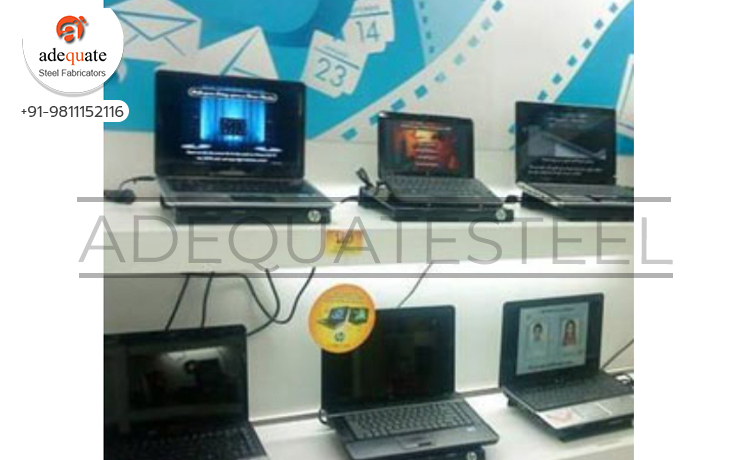 Independent laptop display units are used popularly to grab the attention of walk-in customers.